I prefer print to electronic screens in most respects. I do not own a tablet or an eReader- a laptop and an archaic smartphone (it should probably be leaking chemicals in a landfill somewhere) with no data plan are the digital devices in my possession. Let’s get this out of the way now: I am not a luddite. A large part of my job involves teaching people how to competently operate digital devices. I understand the merit, worth, and appeal of digital reading platforms. I just prefer to read print. I despise being confined to my laptop screen when reading, I prefer the mobility which a book or a hardcopy of an article allows me. But wait, why don’t I get myself an eReader or an iPad? These devices would allow me a similar freedom of movement. To unpack my preference for print, lets consider this quotation from one of this week’s readings: “A platform in its purest form is an abstraction, a particular standard or specification before any particular implementation of it. To be used by people and to take part in our culture directly, a platform must take material form” (Montford & Bogost, 2009, quoted in Rowberry). It is the examination of the platform as an abstraction, at the expense of its materiality, that troubles me. One consequence of interrogating the platform as a physical object (which so far has not been mentioned in this class) is the environmental impact of shifting cultural practices of reading. I do not read eBooks, in part, because I do not wish to purchase their platforms. They have relatively short life-spans and require replacement after a handful of years, either because they stop working or are no longer compatible with current apps. What happens to the device once it is no longer needed? This question, along with others (what minerals were used to make the device and where were they mined? What was the cumulative hydro-pull of this device throughout its lifespan?) are important to ask. So perhaps what I choose to read on the screen has less to do with personal preferences than it does with this nagging question: What are the ecological consequences of changes in cultural reading practices in the age of ubiquitous computing and accelerating climate change? Of course books and the paper industry have an ecological footprint too. As someone who grew up in a pulp mill town in northern B.C., I’ve got the increased risk of lung cancer to prove it. My point is not to idealize the paper industry but to point out the absence of the land in our discussions of the future of the book. That was a very interesting perspective you brought up. I never even considered the ecological aspects or the platform when thinking about the way we read. But now that you mentioned it, your questions about the obsolescences of these devices are really relevant to the way technology is built today. When we consider the number of times new updates or new versions of the same device or platform have been created in the last year, it is astonishing. Especially when we consider this in the long run. Will the devices we use today still be relevant in 5 years? Or will they be obsolete and force us to purchase the next best item, which may become obsolete a few years after that. This all ties into your comment about the ecological implications of this cycle. The picture you included in your post sadly captures the final resting place as it were for the devices that will become obsolete in the near future. Really great and thought provoking post! Thanks for your comment Aneta. 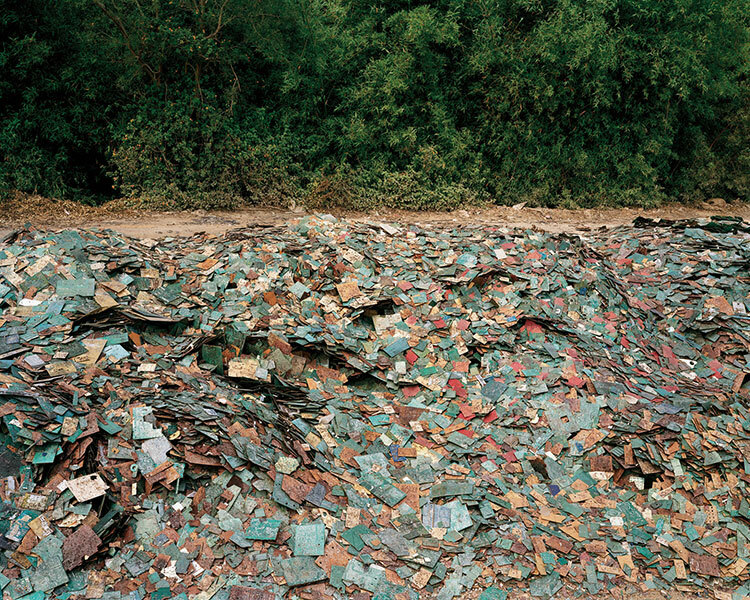 The photo credit belongs to Canadian photographer Edward Burtynsky from his 2006 Manufactured Landscapes series. I really liked this perspective, especially as someone who loves exploring new technology. I’ve often thought about the purposeful expiration of all products these days (from laptops to fridges to shirts to everything else). Mass consumerism is terrifying on many levels. I’m also wondering about efforts to curb the effect of electronics in landfills, such as specialized recycling programs. How much do these actually help? There’s even the issue of e-waste that isn’t as visible (running servers, etc.). Your questions really illustrate a need to rethink how we engage with technology and its afterlife!